Couples renew their vows at regular intervals, such as to celebrate their tenth, 25th and 50th wedding anniversaries, or at times when they want to celebrate their love between those important milestones. Renew your vows privately or invite only your closest friends and family members, or throw a huge party so you can celebrate your partnership with everyone. 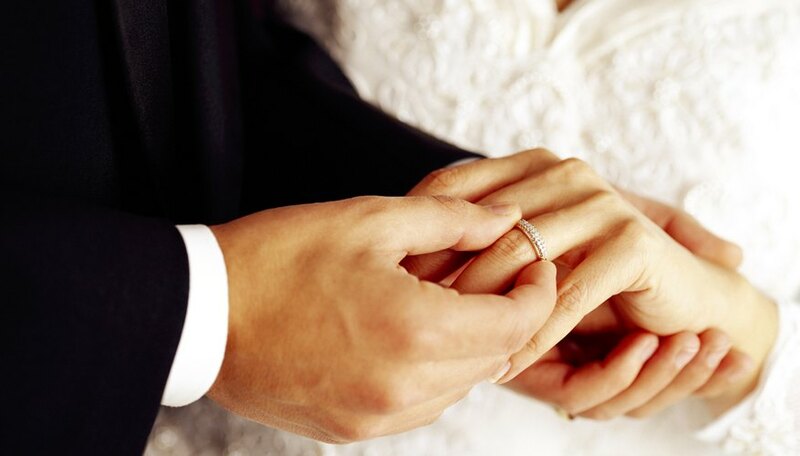 Renew your vows by reenacting your wedding ceremony. For you and your partner, tone romantic way to renew your vows is to recreate your perfect wedding day from years earlier. Remember that special day by reenacting your ceremony while you renew vows. Add new lines to the vows, have your dress altered to reflect your new style, invite new and old friends, and upgrade your rings with special stones to represent the years that have passed and the memories you made, or try to recreate the original day as closely as possible. Some couples dream of taking a romantic vacation, and renewing wedding vows gives them one reason to plan one. Decide together on the perfect location to renew your vows and keep the ceremony as intimate as possible. Choose a getaway at a secluded mountain resort and renew your vows privately, for example. Or visit a quiet beach and repeat your vows while the sun sets. One of the most important things you can do is prepare your vows, which should reflect the way your love has endured and grown, before you travel. If your spouse likes surprises, renew your vows on the spot in a romantic place. For example, invite friends and family members to a quiet, outdoor setting and tell your spouse you're going for a picnic. When you arrive, everyone can quietly gather around the two of you while you express your love and devotion. For a private ceremony, take your partner to a location you both love and wait for a quiet moment to renew your vows. Consider bringing a printed version of your original vows so you can both read them to each other. Go skydiving and read your vows to each other before you open your chutes, or go on a safari in Africa and read your vows while watching giraffes walk across the plains. Go scuba diving or back-country skiing and read your vows under water or in a quiet snow cave. Choose an adventure you would both enjoy, and don't expect many guests to join you as these types of trips aren't for everyone. Murphy, Cara. "Romantic Ways to Renew Your Vows." Dating Tips - Match.com, https://datingtips.match.com/romantic-ways-renew-vows-10061514.html. Accessed 24 April 2019.